I am a fan of Flipboard on the iPad as a newsreader, and really do not use my old favorite Reeder much anymore. However, Feedly has made it onto my tablet, and Mac too. The functionality is similar to Flipbook, although you slide pages up/down or sideways to view the pages. The layout is in a nice digest format, and of course syncs up with Google Reader. I have not tried to add any feeds, so not sure if that is possible, but starring and read status sync fine. Besides, I usually add feeds or organize them on my computer anyway. What really has me sold is the set of plugins for Safari and Chrome. You get a pretty close duplication of the iPad layout, with the added benefit of a larger width display. I looks a tad bit busy at first, but you get used to it quick enough, and the added benefit of having the same presentation as on the iPad makes things nicer and more familiar. I have always struggled with newsreaders on my Mac, I just found the GReader site a bit too much, and most of the apps I tried either were slow to sync or had crashing issues. While Feedly is not exactly an app but a browser plugin, I do my reading in a browser anyway, so not much of a distinction there. I did notice a small Thank You ad on the right side of the browser version, but totally unabtrusive and fine with me since it is a free service. Well worth giving it a try. 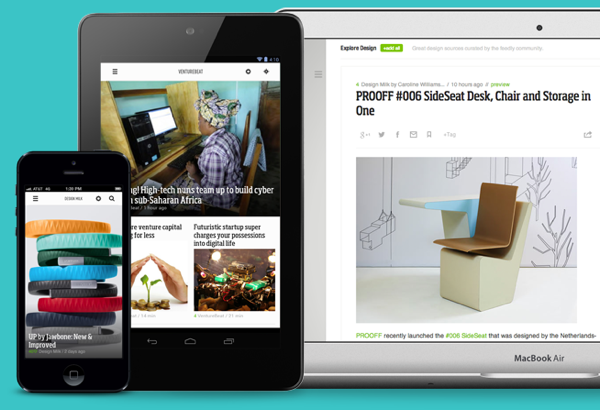 Even if you decide to stick with Flipboard for your mobile device, the desktop version of Feedly is a winner. The page links to Mac, iOS, Google Play and Kindle store apps too. Here comes Koogle with the Koo-koo-koogly eyes!